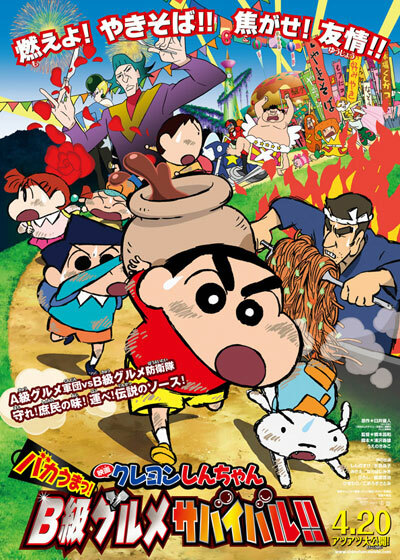 Movie: Crayon Shin-chan: Very Tasty! B-class Gourmet Survival!! Romaji: Kureyon Shinchan: bakauma！ B-kyu gurume sabaibaru!! Shin-chan and the Kasukabe Defense Corps undertake a mission to carry the legendary sauce of B-class Gourmet to the B-Class carnival. The sauce is very important for B-class Gourmet. A mysterious A-Class Gourmet group led by Gourmet-Poy has taken over the carnival. Can Shin-chan and the Kasukabe Defense Corps carry out their mission and bring happiness to the ordinary people?